March 27, 2019, CHICO, CA – The Chico Chamber of Commerce is thrilled to announce that longtime Chico resident and community leader Katy Thoma will serve as the President and CEO of the non-profit business organization. March 15, 2019, CHICO, CA : The Chico Chamber of Commerce has released a Camp Fire Workforce Impact Survey - 2019 Quarterly Update. As our community recovers from the recent Camp Fire, it is the Chamber’s priority to make sure we continue to recognize the loss of housing and the impact on our Chico business community. The responses from this survey will help the Chamber learn about the most current needs of our businesses and workforce. Click here for survey: Camp Fire Workforce Impact Survey – 2019 Quarterly Update. 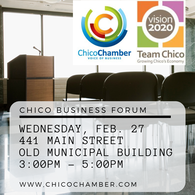 February 27, 2019 CHICO, CA: TODAY Thursday, February 27th, Team Chico & the Chico Chamber will host a Chico Business Forum from 3-5 p.m. in the Old Municipal Building Conference Room, 441 Main Street Chico. The Chico business community is invited to attend this forum to get an update on the current status from the City of Chico Management Team. Q&A will be included. This event is free. With limited seating, RSVPs are requested. To reserve your seat please visit www.chicochamber.com, email info@chicochamber.com or call 530.891.5556. ​February 15, 2019 CHICO, CA: This morning at the sold-out 2019 Business Summit & State of the City Address hosted at the CARD Community Center, the Chico Chamber of Commerce released the 2019 Special Report from the Task Force on City Revenues & Expenditures, calling the City of Chico and community to continue to action around exploring a revenue measure to meet immediate community needs like housing solutions for creating more longtime housing availability, roadway improvements by dramatically increasing road funding, and a reduction in crime by funding a proactive policing model. The Chamber’s goal is to make Chico the safest, most premier, vibrant city in the North State. ​February 5, 2019 CHICO, CA: Thursday, February 27th, Team Chico & the Chico Chamber will host a Chico Business Forum from 3-5 p.m. in the Old Municipal Building Conference Room, 441 Main Street Chico. The Chico business community is invited to attend this forum to get an update on the current status from the City of Chico Management Team. Q&A will be included. This event is free. With limited seating, RSVPs are requested. To reserve your seat please visit www.chicochamber.com, email info@chicochamber.com or call 530.891.5556. ​February 4, 2019 CHICO, CA: Thursday, February 21st, the City of Chico, Chico Chamber of Commerce and Valley Contractors Exchange will host a Community Development Update from 12-1p.m. in the Old Municipal Building Conference Room, 441 Main Street Chico. This free event occurs quarterly and is open to the public. With limited seating, RSVPs are requested. To reserve your seat please visit www.chicochamber.com, email info@chicochamber.com or call 530.891.5556.
fOR IMMEDIATE RELEASE: 2019 Business Summit & State of the City Address Set for February 15, 2019. 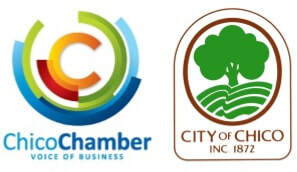 CHICO, CA: The Chico Chamber of Commerce will co-host the official 2019 Business Summit & State of the City Address with the City of Chico on Friday, February 15th, 2019, from 8:30 a.m. – 10:30 a.m. in the CARD Community Center located at 545 Vallombrosa Avenue in Chico. This annual event is free and open to the public BUT RSVP’s are required as seating is limited. The event is expected to reach maximum capacity. 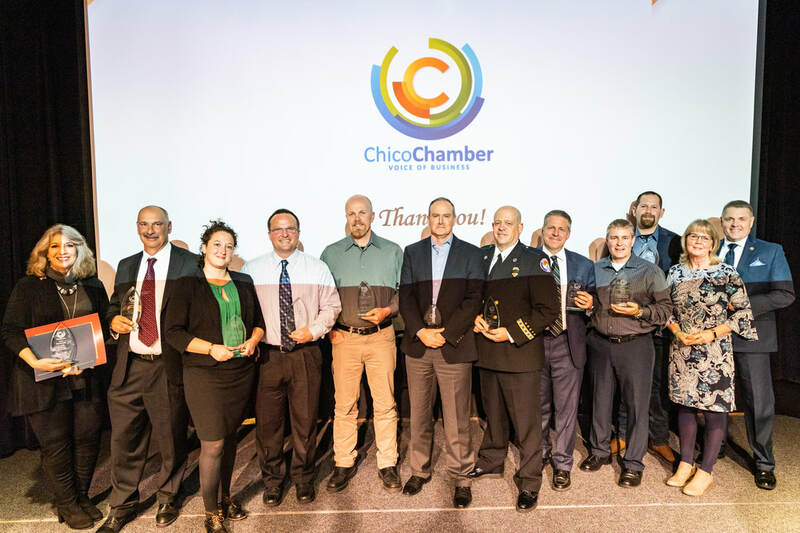 (CHICO, CA): Thursday, January 17th the Chico Chamber hosted the 81st Annual Dinner & Business Awards Ceremony “Bright Community, Bright Future” , in the Big Room, Sierra Nevada Brewing Co. It was a night of hero’s, community, hope and resilience as local first responders, community members and individuals were recognized for their service during the Camp Fire.